Torsion springs are helical springs used to apply a torque or store rotational energy. The two most common forms of torsion springs are single-bodied and double-bodied springs. A common example of a single-bodied torsion spring is that used in a clothes pin. Torsion springs are most often mounted on a shaft of arbor as they must be supported at three or more points. The end configurations (legs) of torsion springs are numerous and are entirely dependent on the needed application. Legs can be straight, angled, hooked or many other shapes as required to secure the ends during rotation. Torsion springs can be designed to operate in either a clockwise or a counter-clockwise direction but whenever possible they should be designed so that the body diameter decreases when a load is applied to the spring. The Arbor diameter of the spring must allow for this reduction to avoid interference during loading. Consideration must also be given to the fact that the torsion springs body length will increase when loaded. The double-bodied torsion spring is a single spring but consists of two sets of coils, one set coiled right hand and one set coiled left hand. The two sets of coils will be connected, usually with an unwound section between the coils and work in parallel. The body coils of a torsion spring are usually close wound but can incorporate a pitch (spacing between the coils) if needed to reduce frictional losses. Rate calculations for torsion springs must consider friction between adjacent coils as well as friction between the torsion spring body and the arbor over which it revolves. Torsion spring loads should be specified at fixed angular positions, not at a fixed deflection from the free position. 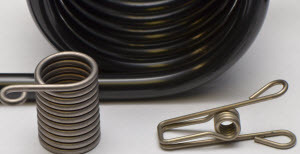 Feel free to Contact Us with any of your Torsion spring needs!